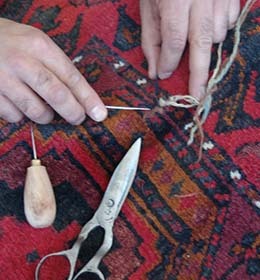 Traditional Rug Repair Service. Free Collect & Delivery. Tears, pulls, burns and holes in a rug or carpet can ruin the look of the entire thing, as can frayed edges, selvages and fringes. Yet it is easier and cheaper than you might think to have it professionally repaired rugs. Sorting out a fault sooner, rather than later, will prevent the damage from spreading and affecting too large a surface area of the rug. Never leave what you might think is an inconsequential repair job, as this can, over time, ruin the entire rug. 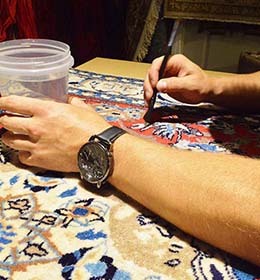 Our Persian and Oriental rug and carpet restoration team uses traditional techniques and exact wool matches to ensure that all repairs are as invisible as possible. We take enormous pride in our work, repairing by hand any damage caused to these beautiful works of art.